Huawei G9 Lite And MediaPad M2 7.0 Both With Fingerprint Scanner Made Official In China! 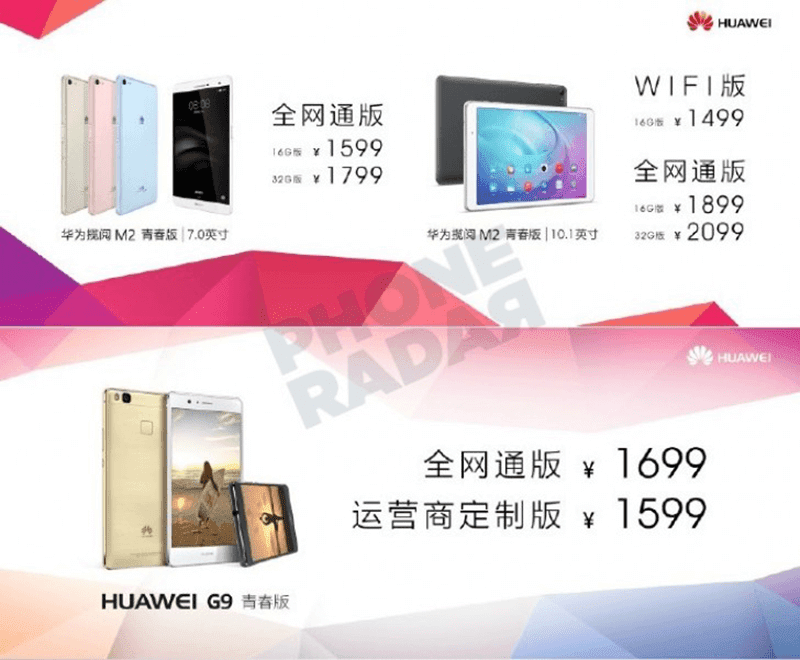 Home / huawei / mobile / news / Huawei G9 Lite And MediaPad M2 7.0 Both With Fingerprint Scanner Made Official In China! Recently, Huawei introduced two new mobiles devices in China, the G9 Lite (localized edition of P9 Lite) and the MediaPad M2 tablet. The Huawei P9 Lite is a ground breaking super affordable midrange phone that touts great combination of style, build and power. It features a stylish / easy to hold solid metal frame with chamfered edges, matte like texture at the back with curved edge and glass on the upper camera part. You'll also be treated with a sharp 5.2 inch FHD screen, 2.0 GHz Kirin 650 octa core chip, high-end Mali T880 GPU, 3 GB RAM, 16 GB expandable ROM via hybrid slot, 3,000 mAh of battery, 13 MP rear camera with manual controls, 8 MP selfie cam, LTE connectivity and fingerprint sensor at the back. It runs on Android 6.0 Marshmallow OS w/ EMUI 4.1 UI on top. The Huawei G9 Lite or P9 Lite retails at CNY 1,699 in China which is around 12.5K Pesos out of straight conversion without taxes yet. Next is the Huawei MediaPad M2, an Android tablet that's specifically curated for your multimedia entertainment needs. It goes with a 7 inch FHD screen at 315 ppi, Snapdragon 615 octa core chip, Adreno 405 GPU, 3 GB RAM, either 16 or 32 GB ROM and 4,360 mAh of battery. It also has a higher camera setup than the excellent 8 inch edition of the MediaPad M2 at 13 MP rear camera and 5 MP selfie camera. What's interesting there is a fingerprint scanner for added security. The Huawei MediaPad M2 7.0 is priced at CNY 1,599 or around 11.6K Pesos for the 16 GB variant and CNY 1,799 or around 13.1K for the 32 GB edition.